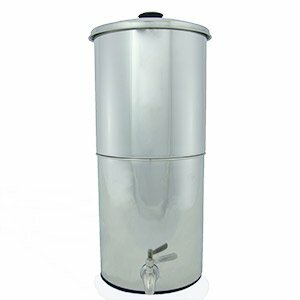 The PropurTM Nomad stainless steel water purification system is economical, convenient and easy to use. The system requires no electricity to provide reliable water filtration just about anywhere whether at home, office, vacation, camping or college dorm! Works with just about any water source including tap, lake, river, stream, pond and rain water. Each container is made from high quality 304 polished stainless steel for lasting durability and attractive appearance. This system is ideal for indoor/outdoor daily use and for emergency preparedness. The PropurTM Nomad is our most versatile system. It has been sized between the Traveler and the Big systems for those looking for portability but desire higher flow rates than provided by the Traveler system. The PropurTM Nomad offers several filter options to fit your needs. It can be equipped with either the ProOne® G2.0 5" or the ProOne® G2.0 7" water filter elements and 1 or 2 filter elements. With 2 filters, you will see a faster flow rate than you would with 1 filter. In a Nomad system, you will find that the ProOne® G2.0 7" filters will generally last longer than the ProOne® G2.0 5" filters, as they have a larger surface area.